The Cline Shale in Texas is one of the hottest new shale plays in the USA. Devon Energy (DVN-NYSE) is suggesting it’s a huge play, pervasive over a very large area on the eastern shelf of the Permian Basin. In fact, the Permian is bursting with new resource plays—what’s old is not only new again, but pistol hot. One analyst report last week said several new resource plays in the Permian are being “unleashed,” and that there are so many multiple horizons or formations that are stacked on top of each other in the Permian—that are just now being accessed with horizontal drilling—that it’s like having 10 or 11 EagleFord shales stacked on top of each other. And interestingly, there is one Canadian listed junior with a large land position close to the middle of Devon’s Cline Shale map. More on that later. Devon got the market’s attention earlier in April when they said they had staked over 500,000 acres and had an unrisked 3.6 billion barrels of oil there. “Unrisked” is a fairy tale number that could be right if every single well hits their type curve. Devon President John Richels also said the acreage was worth $1.35 billion from a partner—presumably for 50%. Devon gave a “type curve” for a Cline Shale well—a guess at how much the well would produce over time—of total production 570,000 barrels of oil equivalent—and 85% of that would be oil and liquid rich gas. (The industry calls that the EUR—Estimated Ultimate Recovery.) The well would flow an average 600 boe/d for the first month (that’s called an “IP30”—the Initial Production rate for the first 30 days the well is on production) and cost $6.5 million. It’s early days in the Cline—Devon’s goals right now are to get more core data, figure out the best way to complete, or frack it (how much pressure, do you use water or oil or propane, what direction do you drill, what chemistry do you use etc.). But initially, they’re saying the Cline is an organic rich shale, with Total Organic Content (TOC) of 1-8%, with silt and sand beds mixed in. It’s about 60-150 metres (200-550 feet) thick. Contrast that to the Bakken where the payzone is often only 10-25 m thick. It lies in a broad shelf, with minimal relief (that means it lies nice and flat), and it’s in the “oil window” (a depth where the right temperature and pressure allow the ancient organic matter to turn into oil—gas is below oil) and has nice light oil of 38-42 gravity with excellent porosity of 6-12%. So there are lots of holes in the rock containing oil, but all those holes aren’t well connected, meaning it has low permeability. That is normal in these tight oil plays. And there are frack barriers above and below the shale—rock types that are really hard and would likely halt any fracturing beyond the Cline—this is important because it means that water will not likely be able to come into the well (and water supersedes oil in coming back up the well—most of the time it’s a real negative) from other formations. 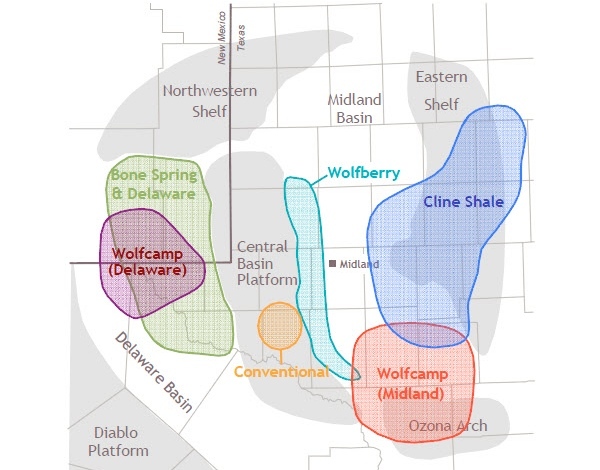 Technically, the Cline Shale—also called the Lower Wolfcamp formation—looks like a great play. And because it’s in the Permian Basin, services like drilling rigs and fracking spreads are inexpensive and easy to access. It’s fascinating for me to watch all these new plays get discovered and developed in Texas, particularly the Permian, because I keep thinking—but it has been explored for years…how do they keep finding new stuff? The reason is mostly the Shale Revolution. The Permian Basin is already one of the most prolific oil areas in North America, producing 35 billion barrels from multiple zones. But now there are even more zones, but they’re all “tight oil.” They’re being made productive by companies who can find the time and resources (qualified people and money) to test more expensive and time consuming horizontal wells—which are usually $5-$9 million now—and quietly assemble a land position without bidding up prices. Horizontal technology and hydraulic fracturing are old news now, in one sense, but the oil and gas industry is conservative and prior to 2008 it was mostly early adopters in the industry that used it. Only since 2009, after oil prices moved back up sharply, did horizontal technology become truly mainstream. 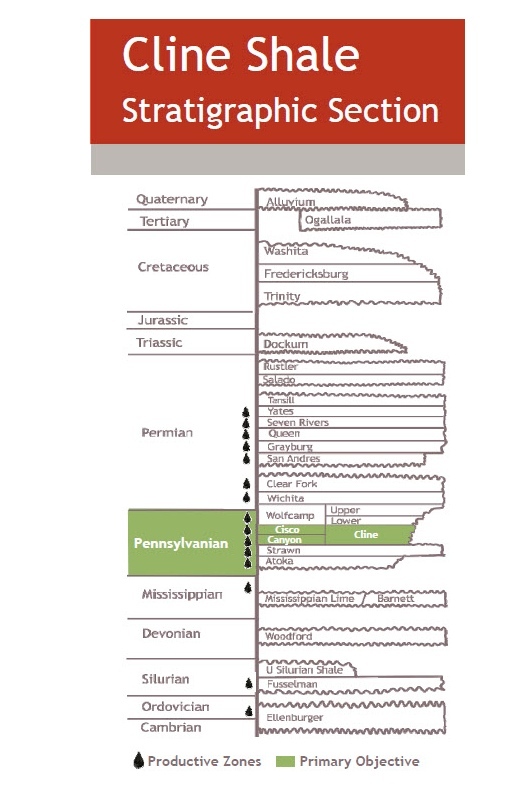 The Cline is actually the “source rock,” the bottom layer of the Wolfcamp formation, which has been drilled with great success vertically for years. But like other formations, exploration slowly moves out from a core area. The Wolfcamp was originally thought to be 20 miles wide and 60 miles long, but now it’s 40×100 miles… and exploration continues. This should all be good news for a fast-growing junior producer with a big land position, the details of which I will share with you in my next Free Alert.